I feel guilty when I buy bread at the store. I know I could make bread for less cost, and I could control the ingredients. Fresh bread smells wonderful and tastes great. The major downside to baking bread here in the summer is the heat. I just don't feel like turning on an oven when it is nearly or already in the triple-digits outside. Some day I might just invest in a solar oven, but until then, I want to try the next-best thing: bread in a crock pot! 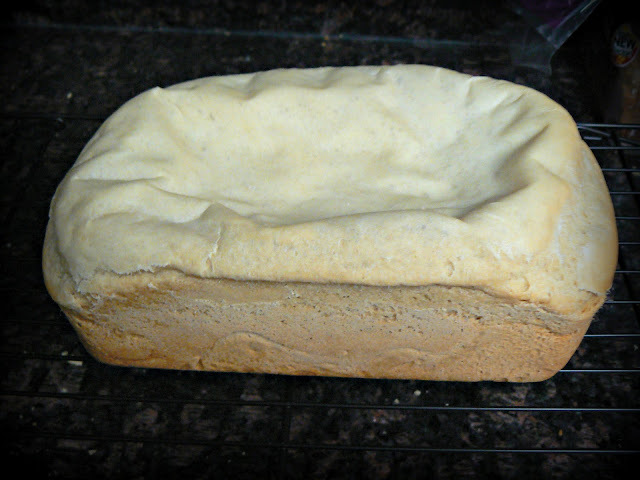 The first time I tried to bake bread in the crock pot, the loaf rose up, up, up and cascaded in a waterfall pattern over the side of the bread pan. Not exactly appetizing. So, for my second attempt I cut the recipe in half. The bread stayed nicely in its pan; in fact, it collapsed into itself. Not exactly the look I was going for. So, now I am on a mission to adapt my tried-and-true recipe so that I can successfully make it in the crockpot. Any bakers out there care to comment on other things to try? I had envisioned this post much differently than it turned out. Next week I will post "Attempting Crockpot Bread, Part 2", and with any luck, I will have a recipe to accompany the post. Thanks Kristi for showing the not so beautiful results of your first attempts. This stuff happens to me too. I didn't know you could bake bread in the crock pot so I'm really interested to see how this ultimately turns out. This is something I have really been wanting to try because of the heat as well. I will learn through you.... LOL. Actually the bread, even though it fell into itself, looks so yummy! I LOVE homemade bread! Try this- perfect every time but not a crock pot recipe. You have to read the comments because that is where the recipe is.